I found an awesome non-family babysitter and she lives across the street. We have come to spend lots of time with our neighbours every few days, mainly hanging outside in their garden . Lilly has come to really love seeing them all but especially Konner. She has gone over to their house three time to bake with Konner who is in University and has the most energetic personality. When she recently offered to babysit I said yes, especially with Sai gone for days at a time. I booked her for Thursday night knowing Sai would be gone and a Zumba class was on that night. Not just any Zumba class but Suzi from Confessions of a Fitness Instructor. I attended her classes when Lilly was a baby and loved it but slowly stopped going because Sai went back to school in PEI and I worked out at home while Lilly slept. I planned my day around this Zumba class at 7:30 pm; about an 8 minutes drive from my house. Hilary had a short nap in the afternoon as “resting” Lilly wasn’t resting but slamming her door multiple times…oh well, that’s life. We played outside, had a snack, played inside and prepped dinner. After dinner I bathed both girls early and nursed Hilary and put her to bed about 20 minutes before her normal time. The goal was to have her asleep before Konner came over. Lilly was standing at our front door in her pj’s at 6:40 waiting for Konner to arrive at 7. I decided we needed to play or she would have been upset that she wasn’t coming over fast enough. We put together 4 different puzzles waiting for Konner to arrive. When she arrived and I told her what she might expect and Lilly basically kicked me out saying “bye Mom, BYE”!!!!! I got the clue, Thanks Lilly. I arrived at Zumba and there were only a few other people in the room…thank goodness because I was second guessing myself for being there. It’s been two years since I did Zumba and I wasn’t sure I would know all the moves. Then a few more showed up. Frig, I thought. But it topped off at 10…perfectly fine with me. I had three women behind me and I should have warned them that it had been awhile. Suzi had informed me earlier that she had some OLD songs that I might recognize and thankfully I did. After about 25 minutes in I was determined to become a Zumba instructor. Seriously! I’d love to do that…it’s the instructor/coach in me. Suzi made it seem like the easiest thing to do and most enjoyable job ever. I had a great time, didn’t feel out of shape or mess up the moves too badly. I am hoping to get back again next week, fingers crossed. When I arrived home all was quiet. Then I walked up the stairs and could hear a little cry. Hilary had woken up about ten minutes before I got home. Konner had calmed Hilary down but then she started crying again once put back in her crib. Konner and I chatted for a few minutes and then I was off to tend to Hilary. She screamed for 45 minutes on and off as I would try to comfort her. I gave up and brought her to bed with me. Cost of cuddling/calming screaming Hilary: PRICELESS. It was a successful night knowing that I left the girls with someone I trust and we all enjoy being around. The only bummer is that she’s off to France in a few weeks for 10 months of school. 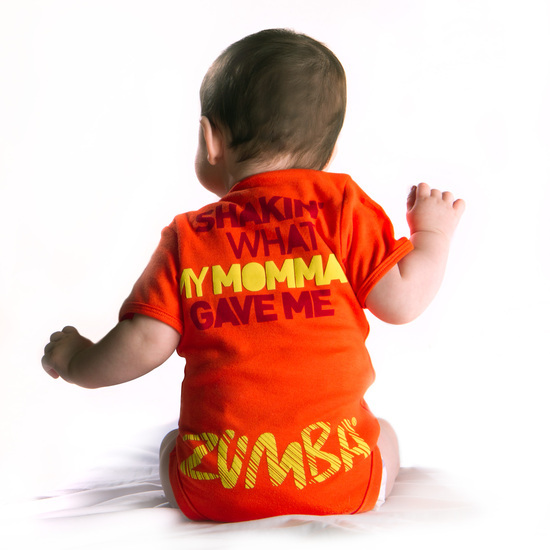 I can’t wait to go to Zumba again and attempt another non-family babysitter when I need to. Do you remember the first time you babysat? I do, it was across from my house at age 12 and I called my mom every 1/2 hour! Sorry Mom. When did you leave your children with a non-family babysitter for the first time? I am a babysitter virgin over here – never did it as a teen and have never hired one for my kids. If I hire one anytime soon, I have a feeling that I will be calling them every 1/2 hour! Glad it worked out so well for you.